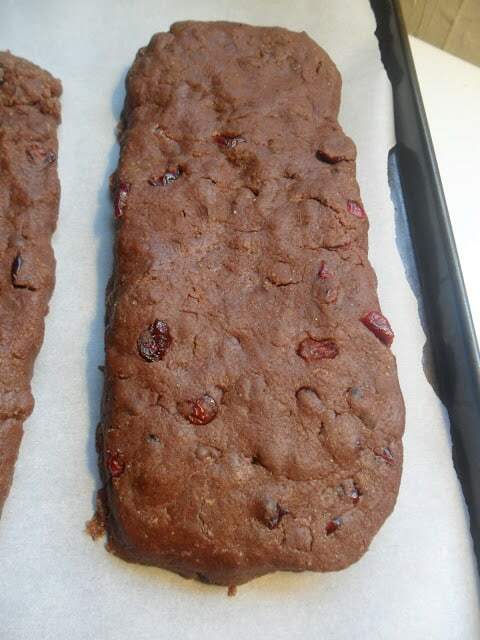 Chocolate Chip Cranberry Biscotti will soon become your favorite biscotti recipe. 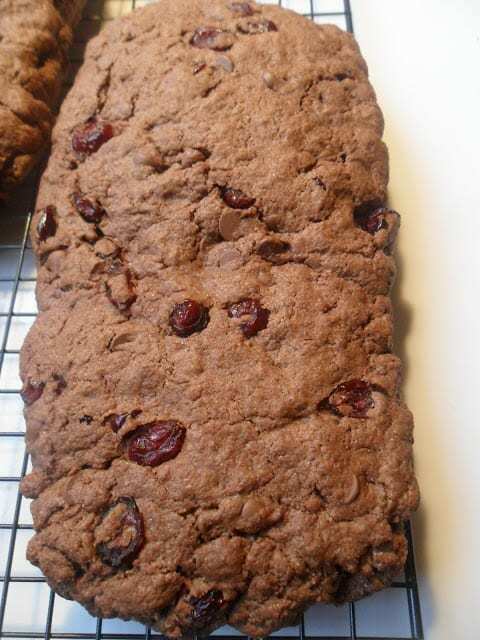 Made with cocoa powder, chocolate chips and dried cranberries. These Italian twice-baked “cookies” rock! With ingredients like cocoa powder, chocolate chips and tart, dried cranberries, you’ll have a ‘cookie’ everyone will love. However, a chocolate glaze drizzled over the baked biscotti certainly won’t hurt. Biscotto; pl. biscotti [bee-SKAWT-toh; bee-SKAWT-tee] A twice-baked Italian biscuit or cookie. First the dough is shaped into a rectangle. The rectangle is then baked. After baking, the rectangle is cooled and sliced. The slices are then baked. The result is an intensely crunchy cookie. Perfect for dipping into dessert wine or coffee. The most popular biscotti additions are; anise seed, hazelnuts or almonds. I have been collecting Nonni’s biscotti ceramic canisters for several years now. I can safely say that I’ve eaten my fair share of Nonni’s Biscotti. In fact, at last count I had 62 biscotti canisters. The majority of the biscotti canisters were filled with biscotti when I bought them but several of the canisters I purchased at thrift stores. Needless to say, they were empty at the time of purchase. All canisters are on display throughout my kitchen. 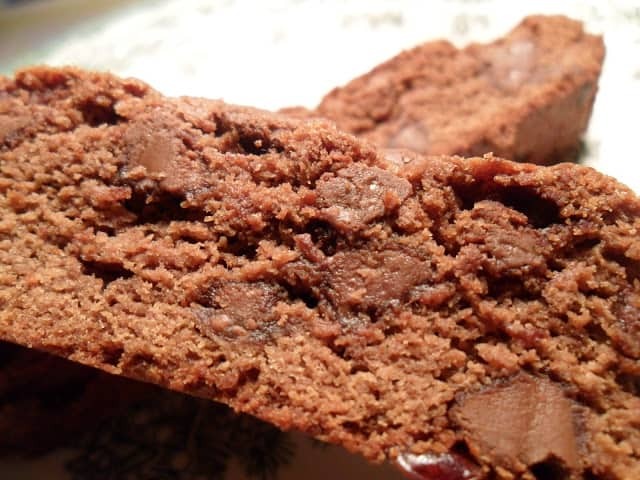 A delicious double chocolate biscotti dotted with tart dried cranberries. Combine the flour, sugar, baking powder, salt, cinnamon and cocoa. Beat together butter, oil, eggs, and vanilla extract. Add flour mixture to creamed mixture. Stir until blended. Add chocolate chips and dried cranberries. Stir together until combined. Turn dough out onto a lightly floured surface, knead 8 to 12 times. Divide dough in half. Shape each portion into an 8 inch long roll. Place rolls, 6 inches apart, onto a baking sheet lined with parchment paper. Flatten dough to one inch thickness. Remove rolls to a wire rack. Cool 10 minutes. Using a serrated knife, carefully cut logs into 3/4 inch slices. Place slices on baking sheet lined with parchment paper. Turn slices over and bake an additional 8 to 10 minutes. Remove from baking sheet, cool on wire rack. 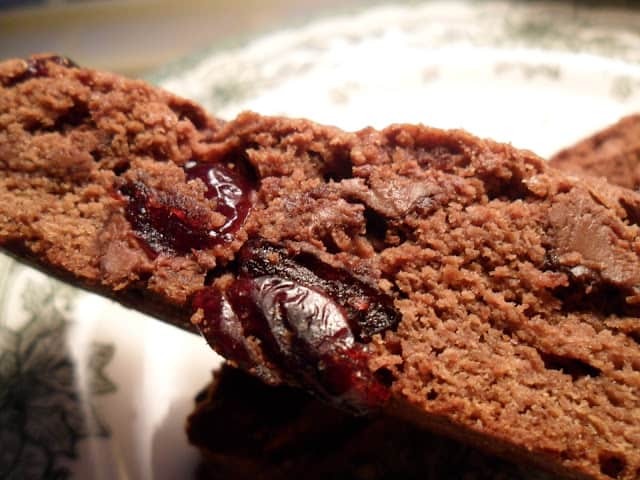 Here are a few other Italian inspired recipes your going to fall in love with; Italian Chocolate Cannoli, Chocolate Chip Panettone French Toast Bake and Gingerbread Biscotti. Stop by our Recipe Box for more inspiration.